A classic minimalistic design inspired by split-flap display seen in old train stations. This clock will catch the eyes of any visitor to your home or office. A great conversation piece! This clock features stainless steel frame and ABS cards to guarantee its durability. Keeps time accurately thanks to the quartz oscillator. It's a great gift to your friends and beloved ones for Birthday, Chirstmas or any other occasion! This timepiece is the best home and office decoration you will ever find. 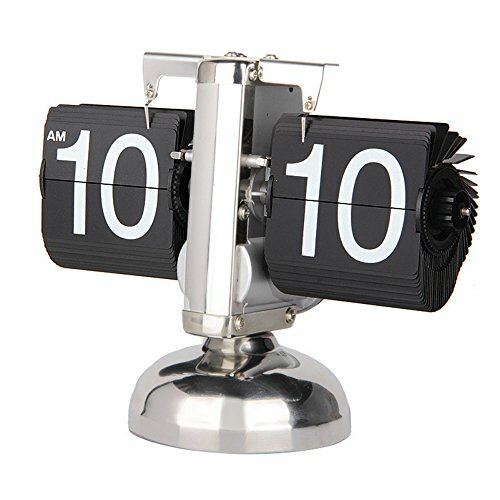 The neat style makes the clock suitable for any room. Huge numbers on the cards makes it easy to read from distance. Adjust through a single knob next to the minute display. It is advised to set the time one minute ahead to compensate the clock's mechanism. 12-hour AM/PM display. 8 inches in length, 3 inches in width and 6.5 inches in height. Featuring stainless steel frame, ABS cards and quartz oscillator. Powered by 1 x D battery (NOT INCLUDED). We stand behind our products! All items sold by BETUS come with a ONE-YEAR FREE replacement warranty. Feel free to contact us! RETRO STYLE - A classic minimalistic design inspired by split-flap display seen in old train stations. This clock will catch the eyes of any visitor to your home or office. A great conversation piece! PREMIUM GIFT - This clock features stainless steel frame and ABS cards to guarantee its durability. Keeps time accurately thanks to the quartz oscillator. It's a great gift to your friends and beloved ones for Birthday, Chirstmas or any other occasion! GREAT DÉCOR - This timepiece is the best home and office decoration you will ever find. The neat style makes the clock suitable for any room. Huge numbers on the cards makes it easy to read from distance. SPECIFICATION - Adjust through a single knob next to the minute display. It is advised to set the time one minute ahead to compensate the clock's mechanism. 12-hour AM/PM display. 8 inches in length, 3 inches in width and 6.5 inches in height. Featuring stainless steel frame, ABS cards and quartz oscillator. Powered by 1 x D battery (NOT INCLUDED). WARRANTY - We stand behind our products! All items sold by BETUS come with a ONE-YEAR FREE replacement warranty. Feel free to contact us! If you have any questions about this product by Betus, contact us by completing and submitting the form below. If you are looking for a specif part number, please include it with your message.